Junior Conservatory Theatre Arts consists of drama classes for grades 6-8 and collaboration with dance classes on a Christmas production. 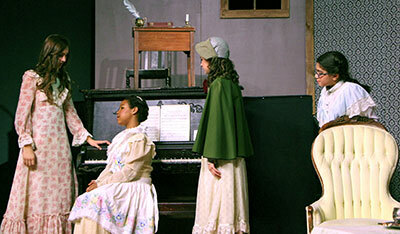 Students receive quality training in acting, voice, and movement. Drama productions are staged in both the VCS Theatre, a beautiful proscenium-style performance space that includes a computer-operated Vortek rigging system for flying set pieces, and the new Black Box Theatre in the Conservatory building. Junior Conservatory classes include Drama 1, which is a fun-filled class incorporating group improvisation and creative learning. It is available to all junior high students who have a desire to learn about theatre arts and basic acting skills, as well as theatre history and technical theatre. Character development, stage direction, and stage movement are a few of the units covered. Drama 2 is open to students who have completed Drama 1. It is for students who desire to gain more experience and knowledge through performing. Students will work on challenging scripts to perform, and they all participate in the fall production.